← 54.000 Bürger fordern: Bundestag muss 5G-Frequenz-Versteigerung aussetzen! 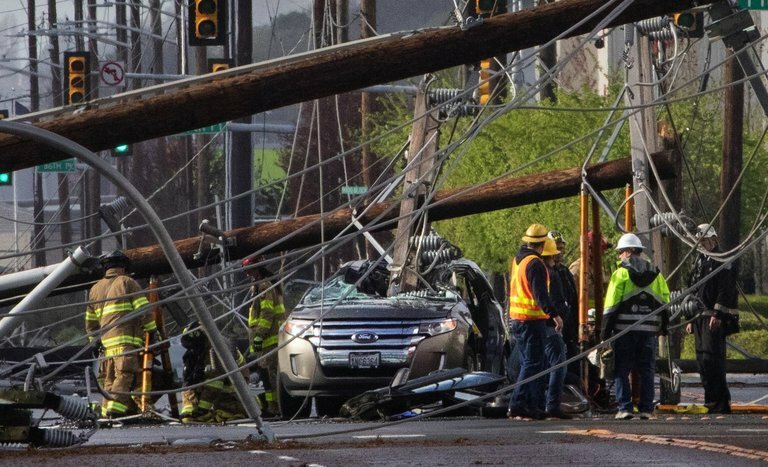 Two people were discharged from the hospital late Friday after 24 power poles came crashing down Friday on East Marginal Way, with at least one plunging into their car and trapping them in a tangle of wood and live wires for more than an hour. Crews had to deactivate the lines as they worked their way in to rescue the two people, who were pulled out around 5:15 p.m. Somehow, despite the dangerous spectacle, neither suffered life-threatening injuries. They were quickly said to be in satisfactory condition at Harborview Medical Center and later released, according to hospital spokeswoman Susan Gregg. Seattle City Light wasn’t sure what brought the poles down and was working Friday to get surveillance footage from nearby to offer clues, White said. He said one witness described seeing lightning strike a pole before it fell, but meteorologists at the National Weather Service in Seattle said there were no lightning strikes in Western Washington on Friday. White said it’s possible the witness saw a spark and believed it was lightning. Wind gusts of 20 to 30 mph were recorded at Seattle-Tacoma International Airport, but the wind had died down well before 4 p.m., Kovacik said. “At the time the poles were falling, the winds weren’t particularly strong,” Kovacik said. After the rescue, the City Light crews’ priority is resetting the power poles and restoring electricity, White said. Then they will investigate the cause, he said. Michelle Baruchman and Sara Jean Green of The Seattle Times contributed to this report. What is the impact of constant exposure of pulse-modulated microwave radiation on people, wildlife and infrastructures? Never underestimate the power of mechanical vibration! Thanks to SC and RC for sharing this article with us @ Z5G!